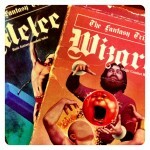 Back in the day, that day when many of you were all about D&D in some form or another, I was playing huge amounts of Metagaming’s The Fantasy Trip. 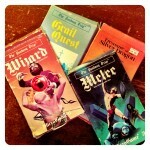 Whether it was arena battles (warriors, wizards, or both, against each other or against monsters) with Melee and/or Wizard, choose-your-own-adventure type microquests like Grail Quest and Treasure of the Silver Dragon, or full on RPG action with Advanced Melee and Advanced Wizard and In The Labyrinth, TFT was really my game. 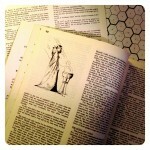 So here’s another batch of heavily filtered photos of some old RPG books for your enjoyment. 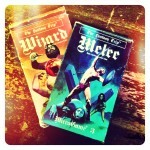 There are a couple of TFT retroclones out there, including Legends of the Ancient World. There are a couple of others, but I’m not having any luck with linking to them at the moment, so I’ll leave you with just the one. 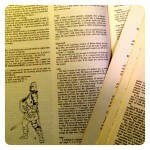 Or you can check out the original Melee and Wizard rules on Bluwiki. 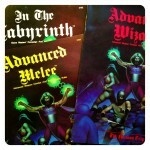 As an aside, I should note that despite its obvious connections to TFT, I never really liked GURPS. It’s just too damned fiddly for my tastes. This entry was posted in TFT on April 25, 2013 by the venomous pao. Mmmmmm, nice. It’s like pron for gamers. I live to serve, daddio. 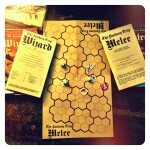 Melee/Wizard is still one of my favorite games. 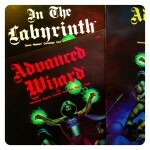 I also bought the full TFT booklet sets, but I still preferred the Light, simplicity of the originals. Legends of the Ancient World (& of Time & Space) is a fitting and even lighter tribute to such a great game series. Melee and Wizard were fantastic games on their own, no doubt. My group pretty quickly moved “up” to Advanced stuff and stayed there, I’m guessing for the same reason that so many people made the same kind of transition from (Basic) D&D to AD&D – the “advanced” thing. But I think it would be interesting to run an old school Melee/Wizard campaign with the skills part of In The Labyrinth thrown in to round out the characters a bit. I haven’t spent much time with the Legends of the… rules, since I’ve still got all of my original TFT stuff quite handy, but it does indeed seem to be a solid homage to the game I love so much. I agree X. I prefer the simplicity of the original little books. I don’t think I have really ever had more fun with a game than with Melee and the programed adventures.